Can you do it? Can you laugh underwater? I, personally, have never attempted this! I have a bit of an anxiety (gee, wonder where my kids get their anxiety issues from) about swimming that I really try to hide from my kids. I happen to like having my feet on the bottom of the pool and I don’t go more than knee deep in the ocean or lakes (okay, the ocean/lake thing I don’t hide quite so well). My nervousness prevents me from trying many things like handstands, underwater tea parties, and apparently, underwater laughing! At the pool today, I wanted to work on getting my kids more comfortable swimming with their faces in the water. Neither of my kids are strong swimmers. 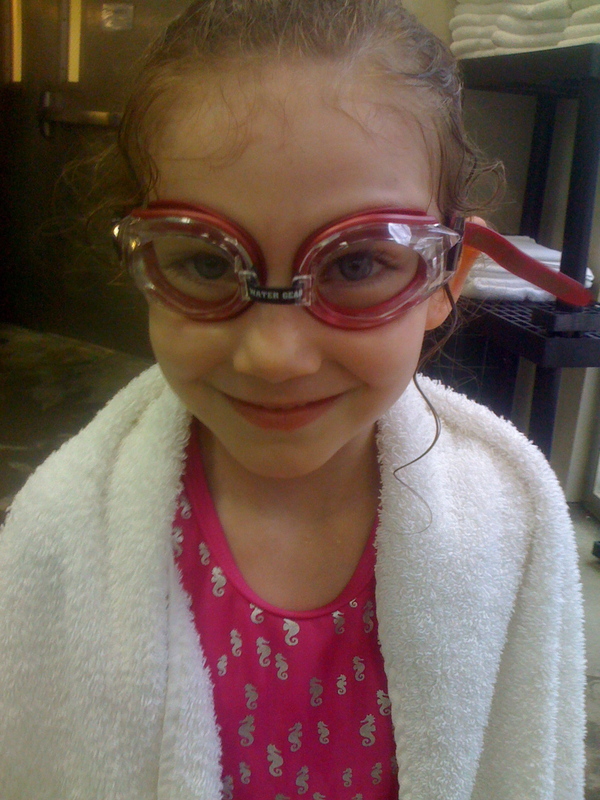 With my own anxiety aside, I wouldn’t trust either of them in to swim more than five feet, and my daughter seems to think that she’s forgotten how to swim entirely, despite the months of swimming lessons she’s received from trained professionals (for which we paid a lot of money, I might add). So after the kids had practiced swimming comfortably with their life jacket or boogie board, I was able to get my little not-so mermaid to shed the life jacket and give swimming a try. Oh, she was nervous! But she was trusting of me (that makes me smile) and found a comfortable step for footing. She checked her oh so important goggles for water tightness, she steadied her footing, she grabbed ahold of the railing with one, she eyed my distance from her and debated how far she thought she could manage. As she pushed away from the step, I could see the fear in her eyes, but you know what? She was smiling! She dove forward, kicked her legs and reached with her arms... she made it to me! Yay!! All smiles! She was ready to try again! With steady footing, she prepared for the lunge. This time, she submerged her face and swam under water to me! Whoa! Where’d this come from? She began swimming back to the step and allowed me to go further and further out. She was definitely getting comfortable. During one of her dives, as she was swimming towards me, being a fish in her words, she apparently spied my son’s hiney (covered) through her goggles underwater. Having the typical sense of humor of a young child, she found this funny! And so she began to laugh! Underwater! I had no idea what was going on so I immediately pulled her up (water anxiety, remember? ), but she was actually laughing! Not kidding! Laughing and smiling, even as I was pulling her from what I thought was a watery demise. Once I realized she was perfectly fine, I was smiling too, but reminded her that maybe underwater isn’t the place to start LOL’ing! Her progress, good humoredness and bravery (I'm still not about to try laughing underwater) was definitely smile worthy! Before anyone decides to pass judgement on me being afraid to go in the ocean, have you watched Shark Week yet? Um, case closed. I'll come up with an excuse for the lake later! It's funny how our children are such different energies and characters. Your daughter sounds fearless. That's going to do her well in life! You know, that's what astounded me! She's no dare devil and has actually been suffering from anxiety. I guess that's why I was so thrilled about her attitude in the water!